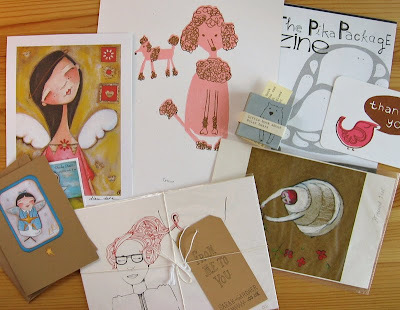 If you like illustration and design, you'll love Pika Packages. 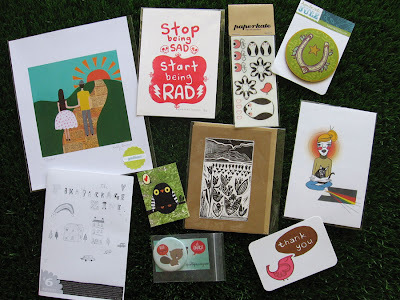 Each package contains a variety of goodies including: a Pickland zine, a gocco thank you card, prints, notebooks, buttons, comics etc and you can choose different sized packages as well (oh, that it were always that easy). hahah! you are so funny, and i am right there in the gutter with you! and i WANT THESE!!! LOVE THEM! Oh good I am glad there are a few of us in the gutter than! I love these little packages, maybe once christmas is over I will order one. You're not alone in the gutter ;) haha, and I also love all these little cards! Great packages! Who ever said the best packages come in small packages was so wrong! Have a wonderful weekend. Now that I'm married to a 23 year old guy, my mind stays in the gutter! These are so fun! I love when you can buy groupings of things. Heading over to enter the giveaway! Oh wow, love this. I want to order them all. 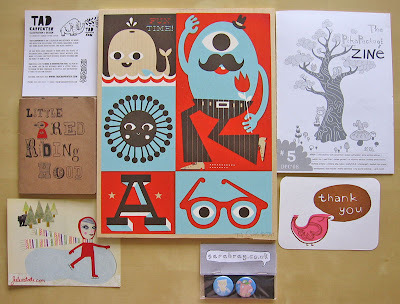 For sure I adore illustration... :O)... Those packages are great, I have to visit the site and learn more about them... Thanks for sharing!! !